Friends, remember that the main reason we do this is because we HAVE to clear out our excess stock that I can't take to festivals (you'll see the reasons below) and if I'm being honest here, there's no way I could possibly hire someone to spend the time it would take to photograph and list all of this stuff. I calculated the time that it takes to set up the mannequin, lighting, and backdrops, dress her up, accessorize her, snap pictures, upload them, resize them and make them true to color, and list them....it takes somewhere around 20 minutes FOR EACH THING. So..uh...multiply that by about 300, and you've got trouble. I have more things than last year, because, well, my company has expanded, and we've killed ourselves trying to get production to be more efficient so we could maintain the already low costs of these high quality costumes. We just simply have more this year. I will be posting more details, helpful hints, and suggestions as the next week passes. For right now, here is the most important info. *This sale will be held on Black Friday, November 23, 2012. *It will be held on BOTH etsy and artfire, and the release times will be at 6:00 AM MST & 9:00 AM MST. We will be listing at the same time on BOTH sites. This might be confusing. Stay with me. These Grab Bags are guaranteed to have one underbust style corset in the size stated in the description. This could include our wench corsets, Torians, or Vixens. All of these corsets are either OOAK, discontinued fabrics, slightly flawed (but still perfectly wearable. Our "flaws" are usually things like mis-matched lining pieces.) or out of older, out-of-date patterns. $55 Level 1 Grab Bags/Overbust *Original Retail Prices-$99-159 These will have the same stipulations as above, but they will be our overbust corset styles (you know, ones that simple go up over the breasts.) such as the Duchess, Crossfire, Courtier, and a host of other strange one-offs. $75 Level 2 Grab Bags/Underbust *Original Retail Prices for pieces combined:$125-$199 These bags will contain one underbust corset (same rules as above) as well as one other piece which will be any one of the following: bloomers, Victorian ruffle Collars, Skirts, Cropped Vests, Hooded Vests, Hooded Capelets, tie-on bustle ruffles, bullet belts, or anything else that I think will be awesome. $95 Level 2 Grab Bags/Overbust *Original Retail Prices for pieces combined: $135-$250 Same as above, except for these will be overbust pieces, just like in level 1. $125 Level 3 Grab Bags/Underbust *Original Retail Prices for all together: $175-$300 These are such a stupidly good price for what you'll be getting that this makes me want to cry. I KNOW what's going into these bags, and you're basically getting an entire outfit for this cheap. Holy Face! 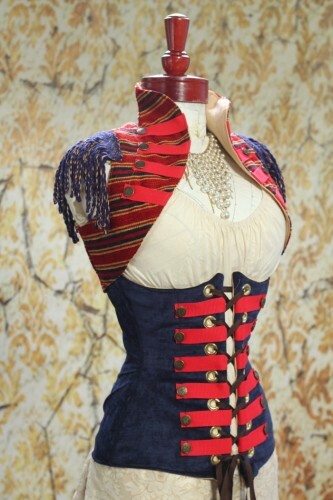 So, this will include an underbust corset, with 2 OTHER PIECES from the list up above, in the level 2 sections. Most of the ones I'll be putting together will be a combination of the corset, a skirt, and either a blouse or a cropped vest. Pretty freaking awesome. $145 Level 3 Grab Bags/Overbust *Original Retail Prices for all together: $225-350 Same as above, same as above, just read. $150 Level 4 DELUXE Grab Bags/Underbust *Original Retail Prices for all together: $350-$500 I'll be up front with you. These are the ones that made etsy glitch last time we did this. They oversold us in a serious way, because people were buying things at the exact same second. One one of the sizes, I only had a quantity of 3, and etsy ended up selling about 8 of them. Anyhow, these will be either Peacock Vixens, Vixen Pirate Coats (with and without their sleeves. It just depends on what I have.) AND a skirt or a blouse. On the coats that don't have sleeves, we made sure that they get BOTH a skirt and a blouse. These are the most bang for your buck, but also the most coveted. They are also the ones that we have the least amount of left over stock. $170 Level 4 DELUXE Grab Bags/Overbust *Original Retail Prices for all together: $400-$575 I These are overbust pieces-think "corsets with tails" which includes all of our overbust pirate coat styles (once again, with and without sleeves.) and our empire corsair sets included with matching underbust corsets. These packages all include at least a skirt or a blouse, but honestly, most of them have both. These are FREAKING good packages, and all of them match beautifully too! It's not as random as it was last time. I figured out that there is a larger size of flat rate box, and we can cram about 5-6 yards of BIG size scraps in there. These scraps will be random colors (which I think is honestly better than just getting specific colors. I have a WIDE range of colors and patterns, and you'll probably get what you would want for a project anyhow!) because trying to separate the scraps into specific colors would take hours and hours and make me want to die. This fabric retails for $29-$60 a yard. If you don't believe me, go and look at freaking JoAnn. It is EXPENSIVE stuff, because it's nice....remember, we only use nice quality fabric? Yeah. What can you do with scraps? Even if you don't sew, you can find easy patterns and instructions online for making mini top-hats, pouches, statement necklaces, spats, wrist cuffs, belts, patchwork skirts, and a ridiculous number of other magical things! These will still be the same S&H ($12) because we are CRAMMING flat rate boxes full, so you're getting an amazing deal, if you're crafty at all! Will there be a way to tell what size they are? I am so excited about this! I didn't find your Facebook page until just after last year's sale, so I missed all the fun last time. Ok I will be setting alarms for 5 AM CST and 8 AM CST. LOL. Thanks so much!!! This is awesome! If you're in the Central time zone, the sales will be at 7 and 10am. 5 and 8am is for Pacific (which I live in). Unless you're setting alarms to be up 2 hours early to get ready...I might be misunderstanding. Are the different times for the different sites? And does Etsy still not have a sticky cart? I seriously cannot wait! I absolutely love the corset cropped vest look above!!! Will that be on sale too?!! Cannot wait! I'm more than a little confused about the Level 4 bags... Pirate Coats and Empire Corsairs are both overbust designs, but you have them listed in the underbust list; is the additional $20 just to ~guarantee~ you get an overbust and not a Peacock Vixen, or am I missing something? Looks like you updated the descriptions of the Level 4s; thanks, they make much more sense now! I'd really like to see a grab bag of accessories next year, but I understand putting them in with the corset bags! Alberta, Canada 3:26pm right now. Hope this means 6:00am Friday morning. The first sale goes up at 6am MST; MST is -7GMT if that helps. Very disappointed in the sale. I couldn't find anything in the size I was looking for. I also didn't see anything on how to buy the $5.00 scrap bags. The scrap bags were for sale in the 2nd round. I'm sorry you didn't pay closer attention to the near-constant updates from Damsel in the Dress on Facebook that were keeping buyers in the loop. Better luck next time, I guess. ... ... ... THANK YOU! This was an awesome sale! I loved being able to check the Facebook page for up-to-the-minute info in-between waiting for grab bags, and even though my slow connection made things tricky I had a blast chilling out with everyone else. And I was VERY impressed with how well-run and organized everything was. Thank you very much for a fun and relaxing Black Friday! I participated in the crazy sale and am happy to say I snagged exactly what I was hoping for on artfire! My corset got swiped from my cart on etsy, but I kept refreshing the page on artfire and got the level 3 I wanted about 30 minutes later. So, brilliant job! I'm glad there were multiple opportunities to get what you wanted!